Socially aware college entrepreneurs often find themselves torn between the impulse to start a business that could bring in substantial profits or fund a nonprofit that could improve the lives of the less fortunate. But here's a secret: It doesn't have to be an either/or proposition. 1. One percent of employee time --two-and-a-half paid workdays per employee--can be used to volunteer with a nonprofit group. 2. One percent of product --the use of iContact's e-mail marketing software for as many as 60,000 subscribers--is donated to qualified organizations in North Carolina. 3. One percent of payroll --in 2009, that was $109,000--is given to 501(c)(3) organizations along with matching contributions made by employees to a maximum of $300 per year. 4. One percent of equity --a 1 percent stake of iContact--has been committed to the iContact Foundation, forming this year. College Entrepreneur of 2010: Will it be You? The UPS Store and Entrepreneur are proud to announce Entrepreneur® magazine's Entrepreneur of 2010 awards. We'll be naming three winners, including a College Entrepreneur of 2010. Candidates will be judged based on the positive effect they've had on their industry and their community. For more information and to enter, go to entrepreneur.com/e2010 . Winners will be featured in Entrepreneur magazine and will be honored at a luncheon in Atlanta in January 2011. For proof, look no further than Ryan Allis, the 25-year-old co-founder of iContact , an e-mail marketing company. Allis was a freshman at the University of North Carolina at Chapel Hill when he met Aaron Houghton, a senior computer science major, through the Carolina Entrepreneurship Club in 2002. At the time, Allis owned a web marketing consulting company and Houghton owned a web design and software company. Houghton had developed a web-based e-mail list management tool, and Allis quickly realized how much better it was than the software he used in his own marketing business. The two joined forces and formed iContact Corp. to sell the service, with Allis handling marketing and Houghton handling development. By their second year in business, iContact swung into the black, allowing the company to engage in something near and dear to the partners: charity work. Through a corporate social responsibility policy referred to as the "4-1s," iContact began donating 1 percent of its payroll, employee time, product and equity to various nonprofit organizations. "My first piece of advice for college students considering starting a nonprofit is to consider doing it with a for-profit model," Allis says. "The only advantage of having a nonprofit is that you don't pay taxes. The big disadvantage is you can't get investments. You can only get donations. People are much less willing to give a sizable donation than they are an investment." Allis suggests that by generating profits, you can accomplish philanthropic goals while maintaining the ability to grow the business without being distracted by having to continually raise donations. 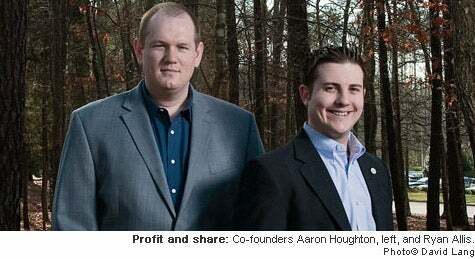 iContact's revenue skyrocketed from $300,000 in 2004 to $26.4 million last year. With 190 employees and a 2009 payroll of $10.9 million, iContact was able to make $109,000 in cash donations last year. The company also donated free usage of iContact to nearly 700 nonprofits and gave each iContact employee two-and-a-half paid days off to perform volunteer work--effectively generating 475 days of volunteer work among 63 organizations. Allis expects the company to continue growing and in turn increase the amount it contributes to the less fortunate. "Therein lies the power of social entrepreneurship," he says.